In the Layers panel, double-click the fx icon on the layer. The Style Settings dialog box opens. Be sure to select Preview so that you can view how your edits are affecting the layer style. Expand the options for any layer style category by clicking the arrow (referred to as a disclosure triangle) just to the left of the layer style name. You can toggle the layer style on and off by selecting and deselecting the style. Depending on which layer style category you use, specify the options. *Lighting Angle: Specify the angle of your light source. If you’ve decided to put together a realistic composite of multiple images, make sure that all the shadows and highlights of all the different elements are consistent. You don’t want one layer to look like it’s 6 a.m. and another to look like it’s 2 p.m.
*Size: Specify the size of your shadow, glow, bevel, or stroke from 0 to 250 pixels. Distance: Adjust how far the shadow or glow is offset (0 to 30000 pixels) from your element. 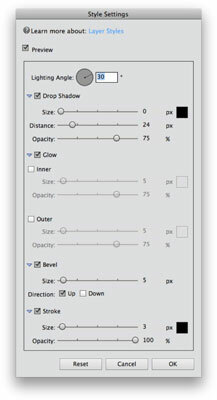 Opacity: Adjust the Opacity setting to change how transparent the shadow, glow, or stroke appears — from 0% to 100%. Inner/Outer: Specify whether your glow is an inner or outer glow. Color: Click the color swatch and choose a glow color from the Color Picker. Click OK to close the Color Picker dialog box. *Direction Up/Direction Down: Specify whether the bevel (the raised or sunken-in edge) direction is up or down. Direction Up positions the highlight along the edge closest to the light source and the shadow on the opposite edge. Direction Down does the opposite, positioning the shadow near the light source. After you refine the layer style settings, click OK. The layer style is edited and ready to go. Note also the options for Reset, to start over; or Cancel, to bail out entirely.